What’s the most important component to your solar power system? Most would say the panels, but technically, it’s the sun. The renewable energy source allows converting sunlight into usable energy. Once this energy is usable, you can either use it or store it. How do you store energy you don’t use? A renewable energy certified battery or battery unit. In part I of this series, we discussed the major components of all solar power systems, and in part II we will go in-depth on batteries, generators, and what’s the best choices in case you weather a power outage. Depending which type of solar power system you decide to invest in, you will need to address a few variable factors. The first is power storage. Do you want to store extra power produced? How will you store the extra energy? The simple answer is a battery, but you will need to decide which battery is the best for your system. Second, what’s your backup power source if you’re off-grid or solar and the grid go down? At West Coast Solar, we want you to use clean energy, but we also want you to remain comfortable in your home if more than one energy source is under duress. The answer to the second question: use a generator. It can be tough to know how to choose the right battery for your solar power system. There are hundreds of types of batteries you can choose from, but you need the best battery for your system. Lead-acid: This type of battery is usually manufactured for a specific purpose. Most of them are not a good fit for renewable energy (RE) applications. Automotive: These batteries deliver short bursts of power and stay “on” all the time, which means they’re highly unsuited for your solar power system. Uninterruptible Power Supply: This is a great battery for backup energy during power outages; however, it doesn’t function well with the required power cycling involved in solar power storage. What is power cycling? It’s the charging and discharging of energy from a battery over and over again, similar to how your laptop or phone battery works. Deep-cycle: As a commonly-used backup in solar power systems, these batteries offer a slow, long discharge of electricity. Although commonly used, you will want to determine which kind to get and if they fit the requirements of your system before purchasing. Flooded: The most commonly used battery type in renewable solar power energy systems. These batteries are designed for repetitive cycling, and they’re easy to maintain, affordable, and long-lasting. Whether you decide to use a deep-cycle, flooded, or an absorbent glass mat (AGM) battery, make sure and discuss your solar power system design with one of our home solar system experts at West Coast Solar. 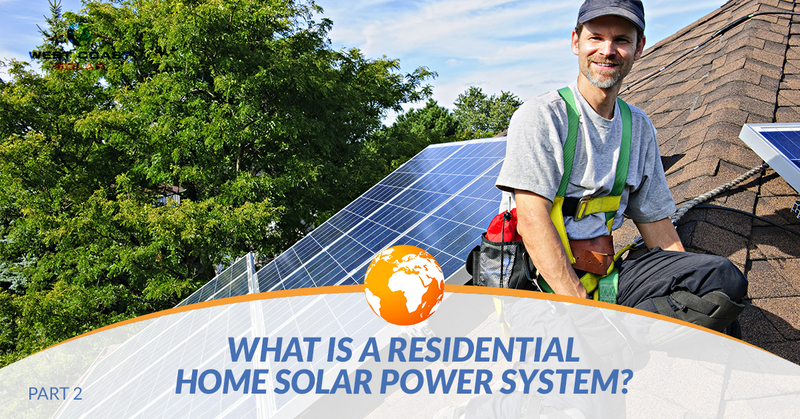 Now that you understand the main components to solar power systems, let’s discuss the different types of systems. Gas/Diesel: The fuel supplied generator has been used for years. They’re reliable, durable, and will work when you need them the most. However, one factor influences further advancement in backup power: The fuel. Once you are out of gas or diesel, the generator ceases to be of any use. Nonetheless, a fuel powered generator is still an option when supplying backup power to your grid tie-in or off grid solar power system. Solar: Another green energy option is to keep a solar energy generator around for backup energy. Although these products are green and powered by the sun, they most likely cannot power every single appliance, light, and smart lock in the house. The best use for solar backup generators are smaller appliances or electronics like a television, toaster, or hair dryer. Are you interested in solar power? Want to transition into green energy? West Coast Solar can help! We’ve been serving Sacramento for years with design, plan, and solar installation. Continue reading this blog series with part III to learn more about the different types of solar systems available. Give us a call today to start your solar design process!